Egypt’s Al-Jihad group on Tuesday announced plans to launch a political arm, ‘the Democratic Jihad Party,’ to back presidential finalist Ahmed Shafiq against Muslim Brotherhood candidate Mohamed Morsi in this week’s hotly-contested runoff vote. The group made the announcement at a conference in Cairo organised by prominent Egyptian human rights activist Saadeddin Ibrahim. “Following the Arab uprisings, Al-Jihad wants to carve out a place for itself in the democratic political arena,” said Ibrahim, who spent years in prison with high-ranking members of the group during the Mubarak era. Al-Jihad’s open support for Shafiq – Mubarak’s last prime minister – was received with surprise by many in the audience, given the group’s violent past and radical ideology. 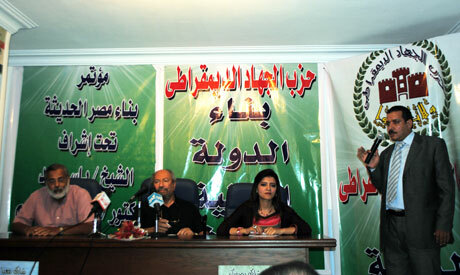 Al-Jihad media chief Sabra Ibrahim elaborated on the group’s longstanding distrust of the Muslim Brotherhood. Al-Jihad’s position on contentious issues, including those related to female dress codes, also appear to have been significantly diluted, as exhibited by young, unveiled party member Hanan Nouredin. Whether the hijab will be deemed a legal requirement by the new party, however, remains to be seen. On issues relating to minority rights, meanwhile, Saad stressed that the new party would take an “all-embracing approach” towards all citizens of Egypt, regardless of religious denomination. Al-Jihad’s new pacifist approach represents a break from its violent past, which led to its international prohibition by the United Nations and various governments based on its alleged affiliation with the shadowy ‘Al-Qaeda’ organisation. The faction’s principal goal had been to overthrow and replace the Egyptian regime with a theocratic state, while US and Israeli interests had been considered legitimate targets by the group. Al-Jihad was founded in 1980 through the merger of two previously-existing Islamists groups: a Cairo branch headed by Mohammed Abdel-Salam Faraj; and an Upper Egyptian branch led by Karam Zuhdi. Following the imprisonment of numerous members due to their alleged involvement in the 1981 assassination of president Anwar El-Sadat, the group broke into two fronts, with those from Cairo remaining part of Al-Jihad while their Upper Egyptian counterparts formed Al-Gamaa Al-Islamiya. The small and disciplined Al-Jihad faction was led by Aboud El-Zomor, who was eventually replaced by ‘Al-Qaeda’ leader Ayman El-Zawahiri following El-Zomor’s imprisonment for his alleged role in the assassination. Once released from prison, many group members fled to Pakistan and Afghanistan to assist the mujahideen freedom fighters there in fighting the Soviet military. Similar suspicions were voiced by Al-Gamaa Al-Islamiya leader Tarek El-Zomor– Aboud’s cousin and brother-in-law – who was also allegedly involved in El-Sadat’s assassination. Do you see the duplicity, they criticize the Ikhwan for seeking to find an Islamic by peaceful means, while they themselves seek a state by way of Jihad. I think the Egyptian intelligence stands behind this pseudo-group. All the notorious groups are behind Shafiq - explains well.